A delicious salad with pearl cous cous, lentils, orange, fennel, dill, sultanas and toasted sunflower seeds is sure to satisfy. There are two types of people in this world, those who love salad and think that warm weather = salad weather, and those who haven't yet had the life-changing opportunity to learn how to make an amazingly delicious salad that is satisfying and keeps them feeling damn fine. I am a big vegetable lover, and in my opinion there isn't much better than a good salad. I don't eat salad because it's low cal or to make up for something else I have eaten earlier, I eat it because the flavours and textures are delicious and satisfying to me and it makes me feel good. Eating lots of veggies makes my body feel good, it helps keeps my mood stable and helps to keep me happy. I'm not saying that vegetables alone are the answer to feeling good, but reaching your 5 serves a day is certainly a great place to start. You can't just have vegetables though, there are a few other vital ingredients to make a truly delicious salad that keeps you feeling satisfied for longer than 10 minutes. 1. Variety of veggies (aim for 2-4 veg) - you know what they say, variety is the spice of life, and the same is true for salads, you need to have a few different veggies in your salad to help keep you interested, and also a few different salads on rotation so you don't get bored. Baby spinach is great and all but eating it day after day gets old. Mix it up, buy a new vegetable that you haven't tried before and see how it goes. Trial and error is the best way to find a delicious combo that suits your taste buds. In my opinion most veg also taste better when thinly sliced or grated, with the exception of tomatoes and cucumber. Cabbage, kale, beetroot, carrot all taste way better then they are very thinly sliced or grated. 2. Crunch - toasted seeds or nuts - having different textures and flavours is one of the things that makes a salad so interesting and appealing. Try roasting some sunflower or pumpkin seeds on a tray next time you are using your oven, or what I like to do is to heat up a fry pan and either dry roast the seeds or use a little bit of olive oil in the pan. You can then use any herbs or spices to flavour them, or leave them plain. Let the toasted nuts or seeds cool before serving, so they are nice and crunchy. Salads with the crunch-factor are a winner! 3. Sweet - fresh or dried fruit - a slightly sweet component is usually a good idea in a salad. Perhaps sweet might not be the best addition to a potato salad, but most other salads with greens would benefit from the addition of some fruit. It really doesn't have to be a lot of fruit, even 1/4 or 1/2 an apple in a green salad would add some different texture and flavour and keep things interesting. A few strawberries or 1/4 - 1/2 a mango are a delicious addition when they are in season, or a spoonful of raisins or sultanas can also work well. 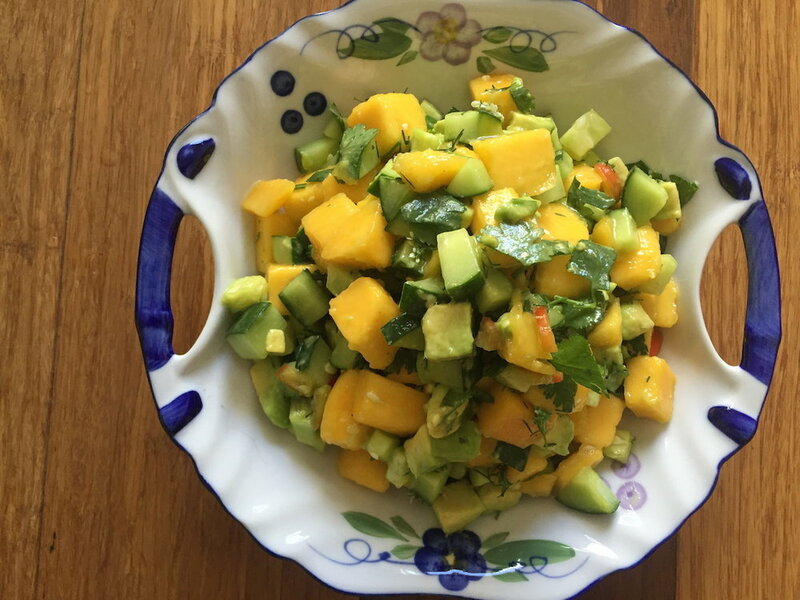 Try one of my summery sides if you're looking for inspiration in using fruit in your salads, or veggie side dishes. Fruit in a salad or a salsa is a good idea. 4. Healthy fats - dressing or avocado - when people say they don't like salad I can almost guarantee it's because there is no salad dressing involved. Use extra virgin olive oil as the base, then get creative with the different vinegars or citrus juices you use. The days of low-fat are over, and we have discovered the health benefits of including healthy mono- and poly-unsaturated fats in our diet. Not only does salad dressing make our salad way more enjoyable (and thus, way more likely that we will eat it), but the healthy fats help our bodies to better absorb the fat-soluble vitamins in our veggies, which means we're getting more nutrition from what we are eating. My go-to salad dressing is olive oil, balsamic and a dash of soy sauce, but I also love using seeded mustard, try this tahini, yoghurt and chipotle dressing with seeded mustard. A delicious tahini, yoghurt and chipotle dressing, perfect for a slaw-style salad. 5. Protein and smart carbs - you don't necessarily need to include these in the salad, but having them with your salad will help your salad to be more filling and satisfying. Adding some protein and smart carbs, also makes sure we're getting a balanced meal to help fuel our activities for the day. Tinned fish, like salmon and tuna are convenient protein options, or you can try chicken, beef, lamb, eggs, lentils, chickpeas or tofu. Smart carbs are carbohydrates that are whole grains and/or contain fibre to help fill you up, along with providing a key fuel source to the healthy bacteria in our gut and also keeping us regular. Try having chickpeas or lentils with your salad, as they can double as a source of protein and a smart carb. 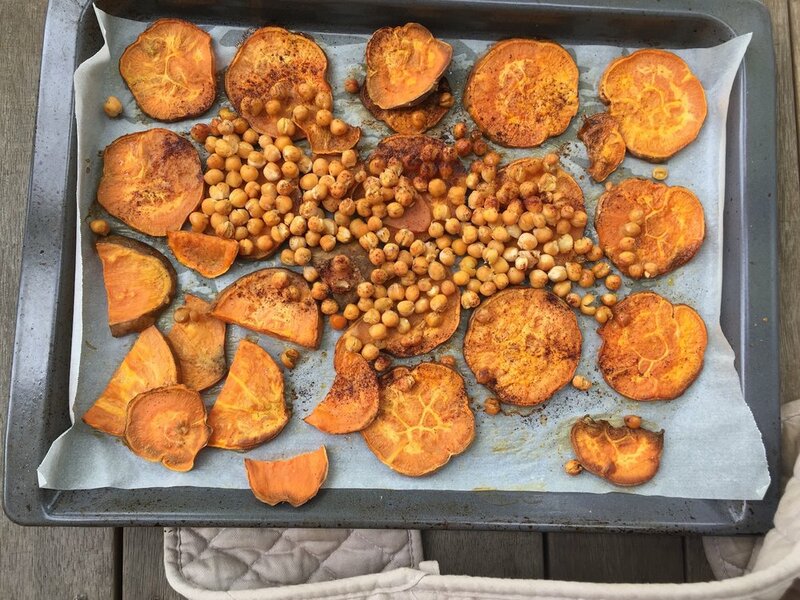 When I am roasting sweet potato for my salads, I like to also add a tun of drained chickpeas to the tray and roast them too. Then I have a crunchy topper for my salad that is high in fibre and protein, along with having the sweet potato, that's a good source of carbohydrates, ready to add to my salads. Adding a tin of drained chickpeas when you are roasting your sweet potato makes a crunchy salad topper that's high in fibre and protein. What's your favourite salad combination? I'd love to know in the comments section below! If you enjoyed this article, share it on.